As Chevy’s Camaro ushers in its 6th generation as it celebrates its 49th birthday, what better way to commemorate this occasion than winning Car of the year after completing a full upgrade? This was just the affirmation that Chevy needed to prove that not only can they make powerfully amazing pickups and SUV’s, but that they still can produce one hell of a b*tchin’ Camaro. Recently, Motor Trend Announced their choice for Car of the Year: the 2016 Chevy Camaro was the lucky recipient. After incorporating a new platform and redesigning the 2016 Camaro from the inside out, being named Car of the Year was just the recognition Chevy needed to earn their stay among American Muscle Cars. It’s what’s making American muscle look so good, again. While the 2016 Camaro doesn’t look entirely new, Chevy’s worked hard to figure out that it’s what’s underneath that counts. Motor Trend agreed. Running on an entirely new platform and being propelled with additional and updated powertrains all while dropping some major pounds, this Camaro is a more chiseled, lean and aggressive hunk of American metal than it’s ever been before. Thanks to its stunning new Alpha architecture, the 2016 Camaro has everyone turning to Chevy not just for their power in pickups, but now for their performance, as well. Rather than being built on the Zeta platform, like its predecessors, the 2016 Camaro is built on GM’s Alpha platform. If that sounds familiar, it’s because it was first used on Cadillac’s ATS and CTS models, one of which was Motor Trend’s 2014 Car of the Year. The Alpha platform was engineered to be lightweight, highly modular and provide excellent dynamic driving conditions. Unlike its previous Zeta platform, the Alpha is longer and more narrow. With all its accolades, it’s safe to say this is a solid and smart platform to build on. Because the Alpha platform structure was already developed for the Cadillac ATS and CTS, and because the Camaro has a wider track (1.6 inches greater up front and 1.2 inches wider in back), painstaking attention was going to have to be paid to the suspension to ensure the proper fit while preserving the Alpha structure. Engineers found a solution by using longer suspension pieces on the same pickup points. Now that it is completely changed, all of the underbody pieces are completely different and are not interchangeable. In order to perform the way they envisioned it to, the 2016 Camaro was going to have to lose weight. Engineers had to get creative with how they were going to shed those unwanted pounds. This 6th generation Camaro is now more than 300 lbs lighter than its predecessors. How did it do this? Like stated earlier, engineers became creative. Swapping materials out, switching metals for hard plastics, doing whatever they could to get the weight down without compromising performance or safety. All V6 models have a front anti-roll bar drop links that are now molded from high-strength plastic. The front suspension is made from specified aluminum with steel links that have extensive lightening holes to keep weight down. The suspension alone lost about 26 pounds from last year’s model. 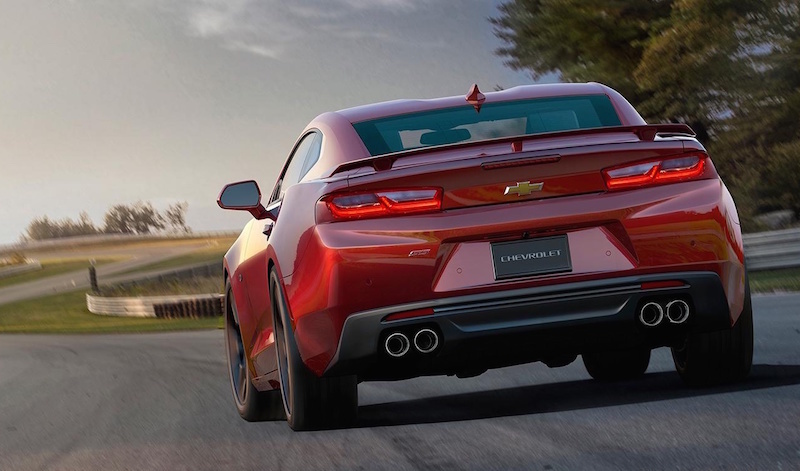 Altogether, the 2016 Camaro weighs 368 lbs less in its 6th generation than its previous generations. Introducing a new powertrain lineup, Chevy also introduced an all-new eight-speed automatic transmission that the propels the SS to be the fastest it’s ever been. These new powertrains have elevated Camaro’s commitment to delivering dynamic and nimble performances. The Ecotec 2.0L turbo comes standard on the LT and as a base model still puts out one hell of a race. Getting to 60 mph in less than 6 seconds, it provides over 30 mpg on the highway. The second choice is a 3.6L V6 which delivers 335 horsepower. Built off the previous award winning V6 deep skirt cylinder block, this current V6 has an all new design that incorporates new features, including Active Fuel Management. Powering the Camaro SS is the Small Block 6.2 LT1 V8. Certified for 455 horses with the same lb/ft of torque, this makes it the most powerful Camaro SS ever. An all new Hydra-Matic 8L45 and 8L90 paddle-shift eight-speed automatic transmissions are now offered in all 2016 Camaro models. The 8L45 is available on the Ecotec turbo and V6 on the LT models while the 8L90 is available with the LT1 V8 on the Camaro SS. When Chevy set out to redesign the 2016 Camaro, they did it with full intentions on speaking to those who want to love their muscle cars again. They want to be proud to buy an American performance car that will deliver power but won’t leave them bankrupt. Chevy has done just this. Making changes to the platform and powertrain, updating their architecture and technology, they made the appropriate changes that people wanted to see. With four trim levels offered and numerous configurations to choose from there, you can start at the base and decide on your level of comfort from there. The base 2016 Camaro 1LT starts at $26,695. This price point is one that keeps Americans buying American products. From there you can go up in trim to the 2LT which starts at $30,795. For those of you who are under subscribe to the “go big or go home” theory, even the SS’s start out perfectly affordable for their high performances. 1SS starts at $37,295 while the 2SS begins at $42,295. Without getting lost in repetitive and costly upgrades that are irrelevant to today’s driver, Chevy focused their attention on engineering a design that is lighter and one that can produce a more powerfully enhanced performance vehicle. For all Chevy has accomplished with their pickups and SUV’s they have truly engineered an American muscle car to be proud of.